Elegant black nails kick off the month of October. Wait. What? Black nails are elegant? Well, yes. Actually, they are. I thought, for a long time that black nail polish was off limits, except as a base for nail art at Hallowe'en. But I came to realize that I wear a lot of deep, vampy, nearly black polish all of the time and it wasn't a big leap to rocking the deepest and vampiest shade of all. 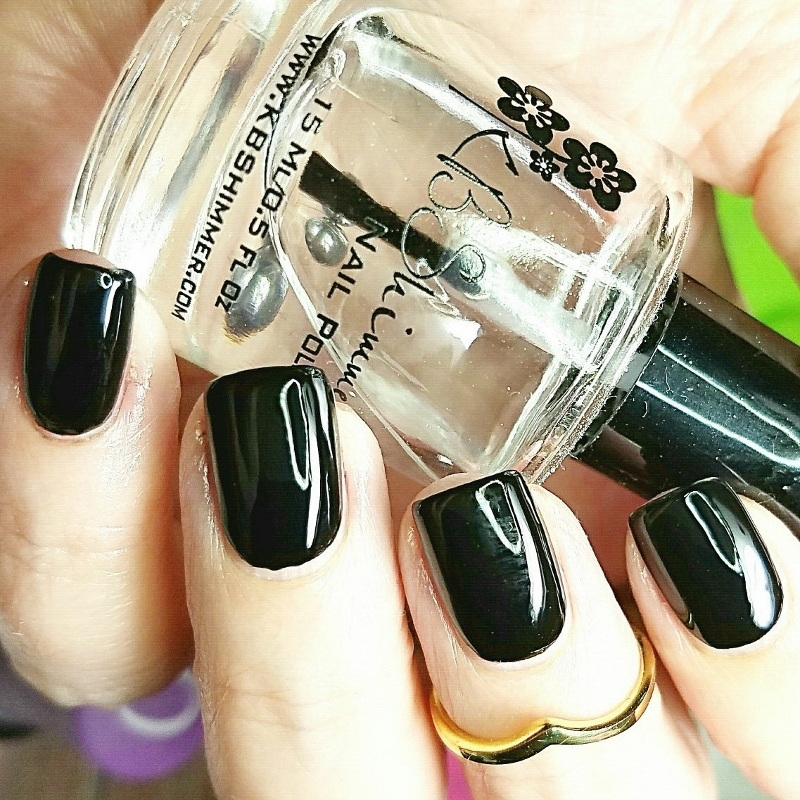 To pull off black nails with aplomb, I make sure that my nails are nicely shaped, I apply a couple of generous coats of base coat to not only help protect my nails from stains, but to be sure that the surface is lovely and smooth. My favorite black polish is, believe it or not good old Wet-n-Wild Black Creme. It's about a dollar a bottle (less, on sale!) deeply pigmented, goes on like a dream and is opaque and perfectly smooth is one coat. Clean up matters. Precise, crisp, clean application is important when wearing such a strong colour. Top it with a quick dry glossy top coat. For this mani I used KB Shimmer Clearly on Top top coat. Ooo! Speaking of nail art. I was in the mood to do something with my nails after a couple of days and I decided that it would be fun to do textural nail art with matte and glossy. First, I gathered my supplies. I didn't need a lot; a bit of foil to work as a palette, a dotting tool, matte and quick dry glossy top coats, clean up supplies in case I needed them and a triple layer of paper towel to catch drips, swirl my cleanup brush and so on. And yes, that is my current paper towel base. I was going to put down new paper towels for this picture then I thought, why? It isn't as if I do anyone's nails but my own so I use my paper towels to their very last, turning them, rotating them until they are destroyed before I put new ones down. This nail art is simply a contrast of matte and glossy. I topped some of my nails with matte top coat. While those were drying, I dotted the shiny nails with matte top coat. 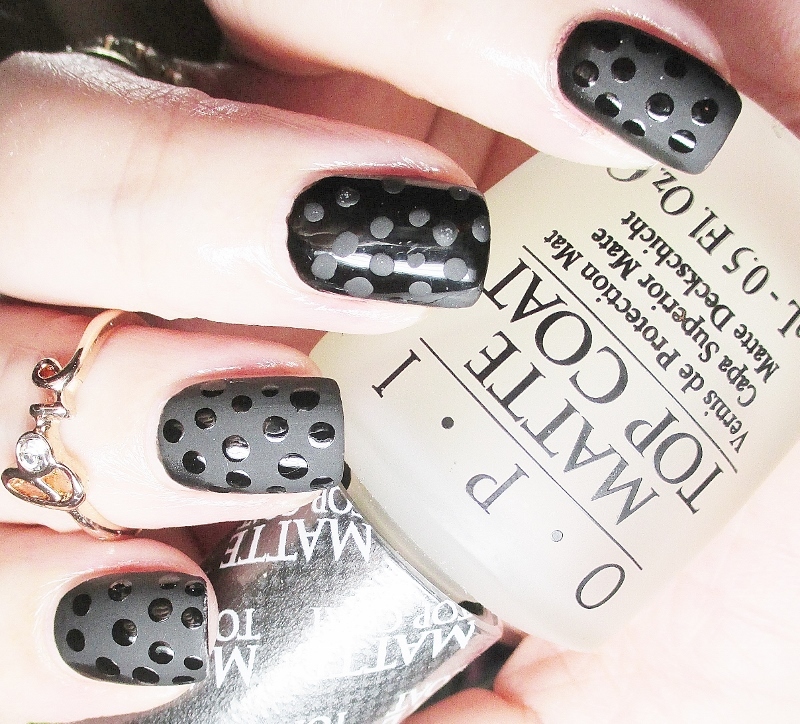 Then I dotted the matte nails with glossy top coat. Since both are quick drying, this nail art was dry and ready to go in short order. Tips for dotting with top coats, put out small drops from the brush onto a palette, work quickly, once the top coat starts to dry or get stringy, wipe and dip the tip of the dotting tool in acetone to clean it off, get out a fresh drop of top coat and continue. This whole design took just a few minutes and I really like how it came out. 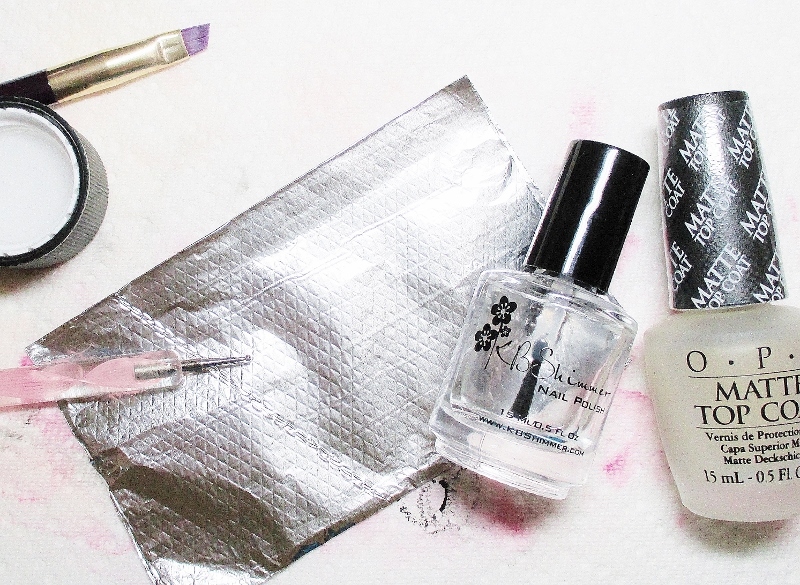 Matte/shiny textural nail art is a great way to add subtle interest to your nails. In addition to dots, you could stamp, use vinyl stencils, freehand paint, sponge... Whatever floats your boat. Do you wear black nails? Would you? And have you tried using different top coat finishes to create subtle nail art designs? If you have and you'd like to share a pic, Disqus allows you to upload photos, so drop one in with your comment, if you like. I'd love to see it.